A ciphertext written on 8 August 1863 with a keyed rotating grille by Confederate agent George T. Sinclair was deciphered by Gaddy (1973). The present author used the plaintext therein to rediscover the grille. A rotating grille is a kind of transposition cipher. Over a matrix of squares, a plate having holes ("grille") is overlaid and letters are written through the holes in the corresponding squares. Then, the process is repeated with the grille rotated 90 degrees in succession. The 20-by-20 grille used by Sinclair and reconstructed by the present author is as follows. (The four 2-by-2 corners could not be identified because these are not used in Sinclair's despatch.) The sides of the plate are numbered 1, 2, 3, and 4 on one side and 5, 6, 7, and 8 on the other to facilitate identification of the grille direction. When the process is complete for the four directions of the grille, every square is filled with one and only one letter, owing to an appropriate arrangement of the holes. In the above figure, each number occurs in four instances corresponding to the four quadrants. In designing a grille, by choosing one of the four instances for each number for the holes of the grille (shown yellow here), it can be ensured that each place falls under a hole in one and only one of the four directions of the grille. It will be seen that the patterns of the four colors correspond to the same grille pattern for the four directions. Use of such a rotating grille in the mid-eighteenth century is found among the papers of Dutch Stadtholder William V. It was popular at the end of the eighteenth century, notably after C. F. Hindenburg first provided a complete description of the scheme in 1796. It is also found among the papers of Alexander Hamilton (see another article). With the keyed rotating grille, called "Rochford's cipher" in the instructions of the cipher by the Confederates, the user specifies a part of the matrix to be used by 10 figures, which are translated to a ten-letter indicator according to a pre-arranged keyword. Taking (a) for illustration, the first pair "11 30" indicates columns 11-30 of the matrix are used and the second pair "13 28" indicates rows 13-28. 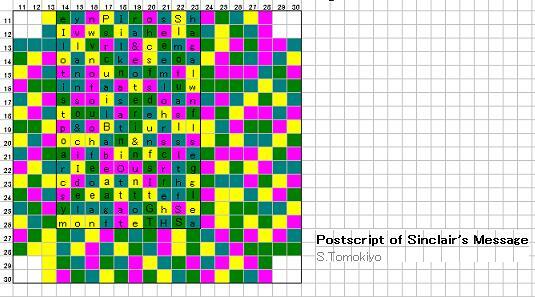 This means each page of the message (a) is written in a 20x16 submatrix and the postscript (b) in a 16x10 submatrix. The last two digits indicate the initial position and the sense of rotation of the grille plate, the sides of which are numbered 1, 2, 3, 4 on one side and 5, 6, 7, 8 on the other. Thus, "6 5" means the initial position of the plate is to have the side "6" up and the plate is rotated to let the side "5" be up next. The working of the grille can be seen in the following for the first page consisting of 320 letters. First, the grille is laid over the ciphertext with the side marked "6" up. In the above illustration, the yellow squares correspond to the holes and can be read. Then, the grille is turned by 90 degrees such that the side "5" is up, at which position the green squares correspond to the holes. Then, after further successive rotations of the grille, the letters of the magenta and blue squares can be read to complete the 320 letters of the first page. To read the postscript, the ciphertext is copied into a 16-by-10 submatrix as specified by the indicator. The front side of the grille is used with the initial position with the side "3" up. In the following illustration, the squares of yellow, then blue, magenta, and green are read in this order. Yours of June 12 just received. You cannot feel more bitterly disappointed than I do [at] the delay at getting my ship off The work on her advances rapidly but it is the opinion of those best advised that until the decision in the case of the ALEXANDRA shall be decided in the Supreme Court, to which an appeal has been taken, any vessel suspected of being for us will be seized as soon as launched & all the expense & delay of the law inflicted on her. Mr. Mason has written to advise me to keep her back & my friends here think it will be far better to get everything ready but not launched [til] the Supreme Court decides. The builders will have everything so advanced that in six weeks she can be off. She could be launched in two weeks. This delay is like death to me but cannot be avoided with the hostility of Earle [sic] Russel [sic], the vigilance of the Yankees & the fear of war among the people universally especially war with the U.S. The late disasters to our arms have added greatly to our difficulties already great. A change in the tide of war would greatly help our cause just now, in England especially. I hope that my Uncle will be able to read this letter from his absent nephew. P.S. P.S. I will consult with Bulloch & if I can get the money I shall make a nominal sale & transfer to the flag of Hanover & get off as soon as possible. Our disasters have confused our finances greatly. Lieutenant George T. Sinclair was one of the agents sent to Europe to obtain ships for the Confederate Navy. He was ordered in May 1862 to go to England to construct or purchase a clipper propeller for cruising purposes and to command it himself (OR Navy, Series II, vol.2, p.191, 228). Sinclair's ship was secretly being built in Glasgow but the British authority made close inquiries into the destination and purpose of vessels being built in Britain and it became more and more probable that the vessel would be seized once it took to sea. The propriety of the seizure of the Alexandra, mentioned in the despatch, in April 1863 was then pending in the British law court. The above despatch appears to have been written on the advice below. As things stand with the British Government, I think it would be imprudent to have your ship launched or to have more done on her, disclosing her character as a ship of war, than can be avoided until there is a final decision in the Alexandra case. Amongst other proofs of the disposition of the Government, what fell from Lord Palmerston last night in the House of Commons would satisfy me that until there is final judgment in this case the Government would be very likely to seize the ship very soon after being launched. It is better, therefore, to incur delay than, under existing circumstances, to run the risk of seizure. Things were made more difficult for the Confederate agents by the "disasters" of the Confederate army, presumably referring to the major defeats at Gettysburg and Vicksburg in the beginning of July 1863. Despite utmost precaution, the Pampero, Sinclair's vessel, was detected and seized by the British authority (OR Navy, Series II, vol.2, p.566, 567, 575; 290 Foundation) and never served the Confederacy. See another article for other Confederate agents Bulloch and North as well as use of dictionary code by naval officers including North. Did Mallory Know the Cipher? Probably, this message could not be deciphered at the Department of the Navy. 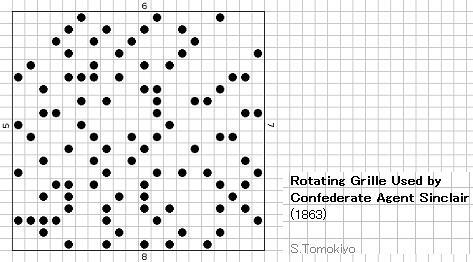 (It is listed as "cipher tables ..." among "Papers of the Confederate State Department ('Pickett Papers')" (Gaddy p.57; OR Navy, Series II, vol.3, p.22).) The sender and recipients were not revealed in the clear and Mallory, Secretary of the Navy, may not have been aware of the content because he harshly complained that Sinclair did not report as expected. The singular failure of Commander Sinclair to advise the department in relation to his vessel induces me to address you specially upon the subject. The note in the only plaintext "I hope that my Uncle will be able to read this letter from his absent nephew." appears to indicate that this cipher was not the scheme agreed upon beforehand. Probably, Sinclair learned of Rochfort's system in England and somehow adopted it as "Rochford's cipher." If the handwriting of the instructions of the cipher could be identified, some insight on this point may be obtained. First posted on 13 December 2015. Last modified on 18 February 2016.